Dear GoSensations.com readers. Few months ago I asked you to propose questions for this interview. It was my fault to publish it so late. Sorry about it. Q. Congratulations on winning the tournament in Paris! (A.D.: http://www.europeangodatabase.eu/EGD/Tournament_Card.php?&key=G110423A&pin=15762175 ) What was the hardest game for you? I saw your game with Cho Seokbin, which you won (with some luck) because of yose tesuji inside his territory. What do you think about his level? For example, can Cho Seokbin get 1p rank in China on his current level? A. For myself, I would prefer short term exchange programs or cultural events. Right now, our summer program has a very encouraging future. But I do know that some of my program partners will do well in long term go programs in Europe. Q. Many Go players think that you are the strongest on KGS. Do you have this feeling too? A. I far from deserve the title because so many high level professionals play or have played on KGS. What's more, high level players of KGS, especially those of 9d, are getting stronger. I guess no one dares to claim the title as the strongest at present and in future. Q. You played lot of games with Russian and Ukrainian stars artem92 and roln111. What do you think about their chances of becoming professionals? A. Artem is a very comprehensive player. His style is really polite and elegant. Roln has a typical Korean style, which is quite aggressive and hard to deal with. But unless they take systematic training in China or Korea, they have small chance to achieve the competitiveness of professionals. Q. Who was the strongest (most famous) opponent you beat in tournament game? 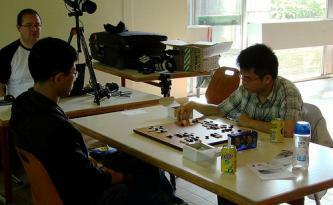 A. I beat Chen Yaoye (A.D: currently 9p and in best 10 in China) soon after we became professionals. It was my last win against him. He had made so much progress in such short time that I could barely withstand him two years later. Q. Many Chinese pros regularly visit preliminary stages of World cups like BC card or LG in S.Korea. Why do you ignore such events? I feel that your chances to enter main stages are not small. A. The time of such world cups often coincides with my school and work schedule. Also, although I'm confident to win several games, I don't think I have much chance to enter main stages. Do you try to get your 3rd dan pro? I've heard it's getting more and more difficult because there are a lot of very young pro players which are very strong. A. I would most probably have gotten 3p, had the 2003 rank tournament not been canceled. But I seemed to have lost my drive when I entered college in 2004. In your opinion who is the strongest player in Europe? A. I would say Catalin and Dinerchtein are more profound players. Ilya, Artem, Pop, Csaba are really strong as well. Personally, I'm a fun of Debarre's style. I can't comment on other famous players because I haven't seen much of their games. How many hours per day do you spend playing/studying Go ? 1.What do you think KGS is missing. Specially compared to servers like Tygem or Cyberoro. A. Lack of Pro players is definitely a weak point. And I don't think KGS is sufficiently promoted. The fact that many professional players can hardly use English is also an external constraint. 2.What would be necessary for KGS to attract more professional players? A. For active professionals, an important thing is to facilitate communication between users with different languages. Many professionals have little English training. They can use the current version, but it's really hard for them to communicate with users of a different language. Also, I think retired professionals need more initiative to use KGS, for instance, monetary initiatives. I've noticed you play twoeye 7d a lot. Do you like his fighting style or is he a friend of yours? A. I'd say it's because his time setting suits me. I've got quite heavy work load and study load this year. I don't have much time to play slow games. Of course, I'd be glad if twoeye 7d and I become friend someday. 1.How do you studied go when you where amateur? 2.What do you think that is the main difference between the asian level of play and European or American? A. Mostly through tournaments and training games. And we have professionals as our coaches. Asian professionals are trained in high level and intense games, so they know what choices to make and alternative strategies to take in real games. What are your goals as a go player? Do well in tournaments, get your own go school or ...? A. My goals changed and developed through years. There are personal reasons and there also are some profound meanings to me. Do well in tournaments is definitely an initiative, but not my primary reason. In college, I've met many friends through go. I started to like it as something fun in my life other than mere training and tournaments. And I want to share it with others. That's why I promoted go course in my university and later started our program www.experience-go.com. I gradually found more profound meanings for our program, something cultural that I'm proud of and eager to introduce to my foreign friends. Go culture originated in China and was spread to Japan and Korea. Go represent a indispensible part of Chinese and Asian culture. Even after thousands of years, it still attracted millions of people worldwide. Through our program, I was able to present go as culture to my students and it help them to understand how professionals think in a game. I've made friends and some of them have become competitive go players that are active in Europe. I love the thought that I'm able to share my passion for go with so many people worldwide who enjoy go as much as I do, and help them achieve their goal as well. Do you play on Tygem ? Can you tell us your handle there ? A. Quite often. I've always been at 9d level, and my score/point between 36000-37500. How serious are you playing on KGS - are your games just for experimenting and having fun? A. It depends. I'm fully concentrated in about 30% of games. Thanks for the nice interview! Did not roln111 already have studying sessions in Korea last year? Great interview! Thank you very much MilanMilan and of course thank you Alexander Dinerchtein!